As shown above, if the value of the cjMaxBits argument is non-zero, it is prioritized over the return value of the GreGetBitmapBitsSize routine. 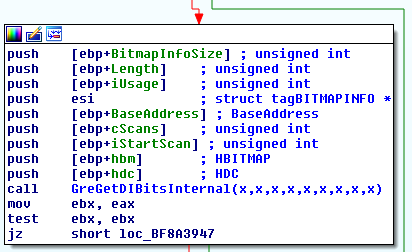 It is also interesting to note that after performing an initial validation of the pjBits pointer with a ProbeForWrite call, the user-mode memory region spanning from pjBits to pjBits+cjMaxBits-1 is locked, so it cannot be unmapped or restricted beyond the PAGE_READWRITE access rights. By doing so, the kernel makes sure that all subsequent read/write accesses to that area are safe (i.e. won’t trigger an exception) until a corresponding MmUnsecureVirtualMemory call, which in turn allows it to skip setting up a very broad try/except block over the entire logic of the system call, or using a temporary buffer. 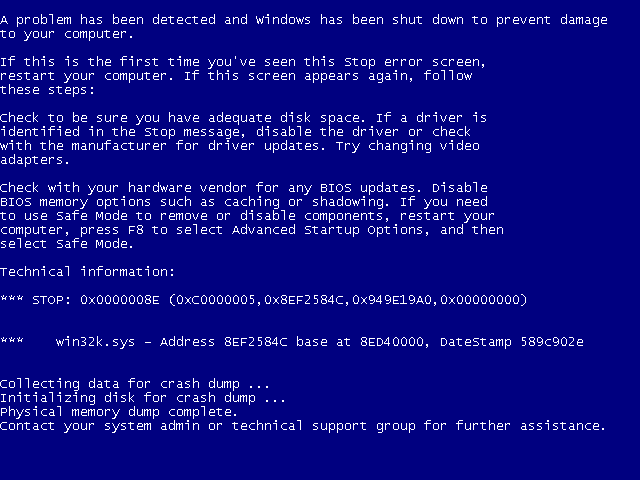 On the other hand, the logic is very reliant on the specific number of bytes being locked in memory, so if the kernel later tries to dereference even a single byte outside of the secured user-mode region, it is risking triggering an unhandled exception and an accompanying Blue Screen of Death. Here, the 2nd argument is the pointer to locked user-mode memory, and the 5th argument is the maximum number of bytes which can be written to it. The inconsistency is quite obvious: while NtGdiGetDIBitsInternal uses cjMaxBits (if it’s non-zero) as the maximum buffer length, the internal EncodeRLE functions use another value passed through an input structure field (bmi->bmiHeader.biSizeImage). If the former is smaller than the latter, and the size of the requested data is sufficiently large, it is possible to make EncodeRLE access bytes outside of the protected region, thus generating the desired unhandled kernel exception. Notably, this condition can only lead to a local DoS, since the buffer overflow is linear, and the buffer itself is guaranteed to be located in ring-3 memory with the initial ProbeForWrite call. Nonetheless, I find the flaw interesting, as it demonstrates the importance of consistency in kernel data processing, especially where buffer lengths are involved. A functional proof-of-concept code is quite simple and can be found below. It works on Windows 7 32-bit (due to a hardcoded syscall number) and expects an input bitmap in the test.bmp file. We used a 100 x 100 x 24bpp white image for testing purposes. The essence of the bug is visible in lines 42 and 57 – only a single byte of the output buffer is secured, but the kernel may write as many as 0x10000000. // For native 32-bit execution. // Initialize the graphic subsystem for this process. // Load an external bitmap as HBITMAP and select it in the device context. // Allocate a 4-byte buffer for the output data. 8ef2584c c60300          mov     byte ptr [ebx],0           ds:0023:000f1000=? ?